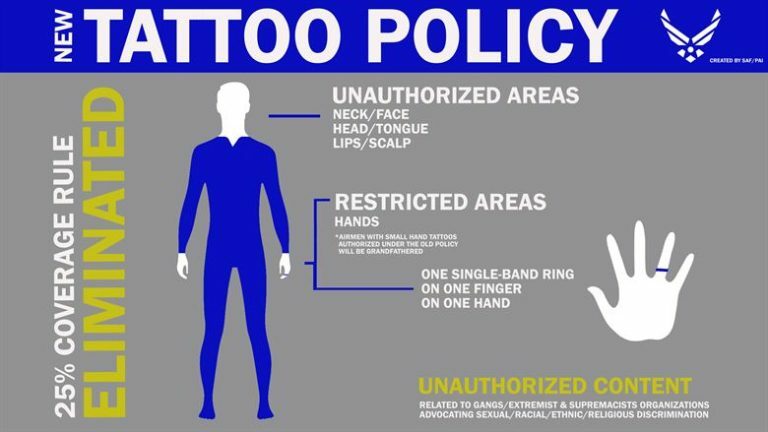 Tattoos/Brands anywhere on the body that are obscene, advocate sexual, racial, ethnic, or religious discrimination are prohibited in and out of uniform. 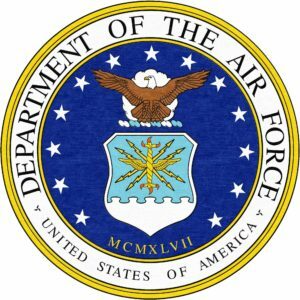 Tattoos/brands that are prejudicial to good order and discipline, or of a nature that tends to bring discredit upon the Air Force are prohibited in and out of uniform. Any member obtaining unauthorized tattoos will be required to remove them at their own expense. Using uniform items to cover unauthorized tattoos is not an option. Members failing to remove unauthorized tattoos in a timely manner will be subject to involuntary separation, or punishment under the Uniform Code of Military Justice (UCMJ). Excessive tattoos/brands will not be exposed or visible (includes visible through the uniform) while in uniform. Excessive is defined as any tattoo/brands that exceed ¼ of the exposed body part and those above the collarbone and readily visible when wearing an open collar uniform. Members who receive tattoos/brands not meeting the standards after the effective date of this policy (1998) are required to initiate tattoos/brands removal upon notification by their Commander at their own expense (may not use Air Force Medical Centers for removal). Members not complying with these requirements will be subject to disciplinary action for failure to comply with Air Force Standards and may be involuntarily separated. Additionally, per AFI 36-2903, paragraph 2.10, commanders will retain the authority to be more restrictive for covering up tattoos, body ornaments and personal grooming standards based on legal, moral, safety, sanitary and foreign country cultural reasons. Members are encouraged to review the Tattoo Policy Guidance Addendum for additional clarification as to what constitutes a tattoo, brand or body mark, and for more details on what is unauthorized. Violators of prohibitions outlined in the policy are subject to prosecution under Article 92 of the Uniform Code for Military Justice. For additional information about dress and appearance, visit the Air Force Personnel Center website. Skin irritation that improves with Laser Hair Removal. Laser Hair Removal…Why more men are doing it! Laser Hair Removal…When and Why.